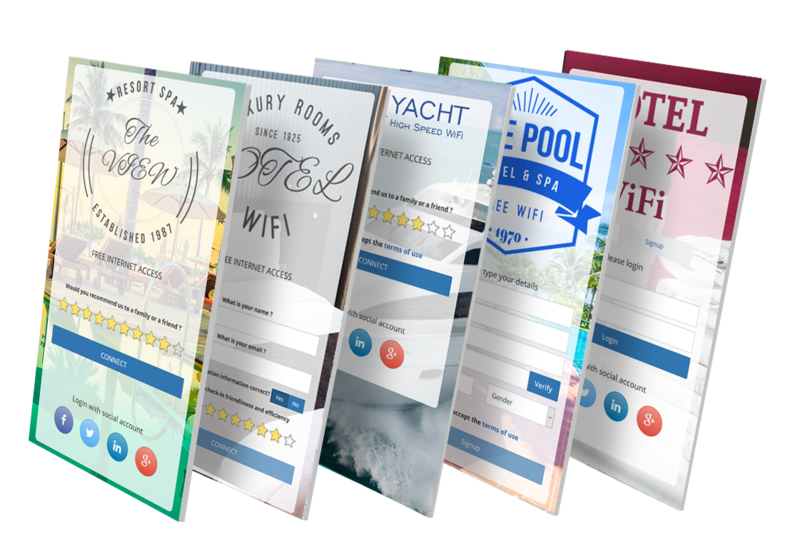 Create a free or paid Hotel Internet access, integrate with Hotel PMS software to automate guest login with room and name, engage guests with advertisements, collect surveys and understand what you can do better to improve guest satisfaction. Hotel WiFi is a robust and cost effective solution suitable for any hospitality deployment. It controls user Internet access, sets limits, processes payments, engages users, provides powerful analytics and helps you run different marketing strategies to maximize revenue from your hotel WiFi. 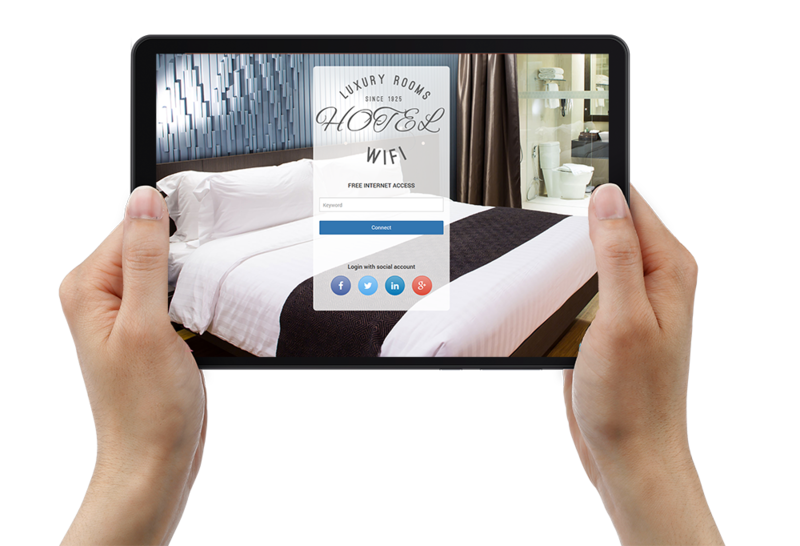 Hotel WiFi solution needs to be great – as your guests expect it. Take your WiFi to the next-level and improve quality of the Internet service, guest satisfaction and overall Hotel review rating. Variety of login methods, suitable for multiple guests’s devices, will make your guests happy. How can you improve Hotel Internet? Integrate Hotel WiFi with your PMS system (Opera and 30+ other systems) and automate billing for your guests. System can be configured to provide free access (no charge), to apply complimentary plan to member or loyalty guests, or provide list of available plans so user can choose and pay. How Hotel WiFi Works ? 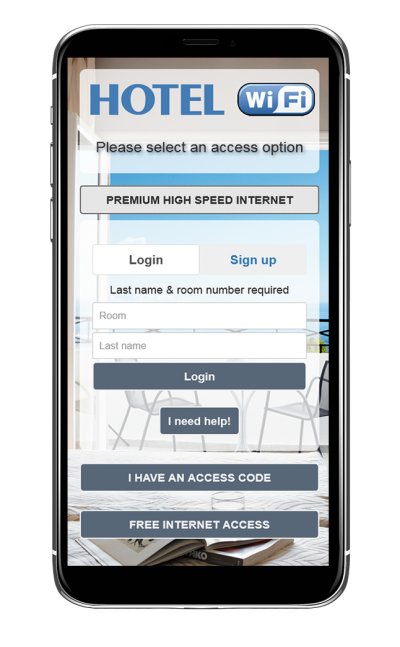 When your guests connect to the Hotel WiFi, a nicely designed splash page will appear on their device. You can easily customize splash page with logo, background and colors, and decide how your guests will start their session. The splash page can be configured to offer free Internet, high-speed paid access, collect email and customer data, login with social network account, show video advertisements. One of the most important features is integration with PMS – a guest can login with the room and name after check-in. Once logged-in, guest may be redirected to the welcome page, hotel website or promotion page. The guest may be limited with download and upload speed, available bandwidth transfer, time to use your service, expiration, and limit access to one or multiple devices. That provides good WiFi experience for all your guests, and prevents one user taking most of the bandwith for hi-def video streaming. Offer complimentary Internet access with Social WiFi. Engage WiFi users using Social network feature. Each WiFi location or business venue may have different branding and Internet access limits. Collect user data on one location, bill high-speed access for another, or display video ads for Internet access. During signup, guest can choose an Internet plan which can be free or paid. Free complimentary access comes with lower download and upload speeds. Engage WiFi users with video or image ads. Location based video ads acounts for the best engagement motivators with high conversion rate. Social network WiFI access is the quick and easy way tp collect emails and names of your customers and use it for marketing campaigns. Customer survey is a great tool for collecting guest data, opinions and reviews, which can be used for marketing purposes and improving your service. DNS Server is used to implement Web Content Filtering engine that can easily block unwanted websites from being accessed on your Wi-Fi. Hotel WiFi solution will help you to promote hotel amenities, offer high-speed paid Internet access, and collect guest surveys – so that you can get real-time feedback and use it to increase your rank on TripAdvisor and Booking.com. Analytics reports include demographics, bandwidth usage, session statistics, unique and repeat visitors per hotel, loyalty report and more.